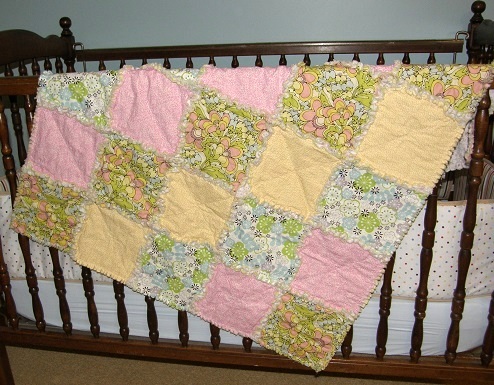 Beautiful handcrafted baby quilts are one of the most cherished gifts I ever received as a new mother. Knowing that someone took their time, energy and creativity to put together such a beautiful baby blanket made me feel very special! 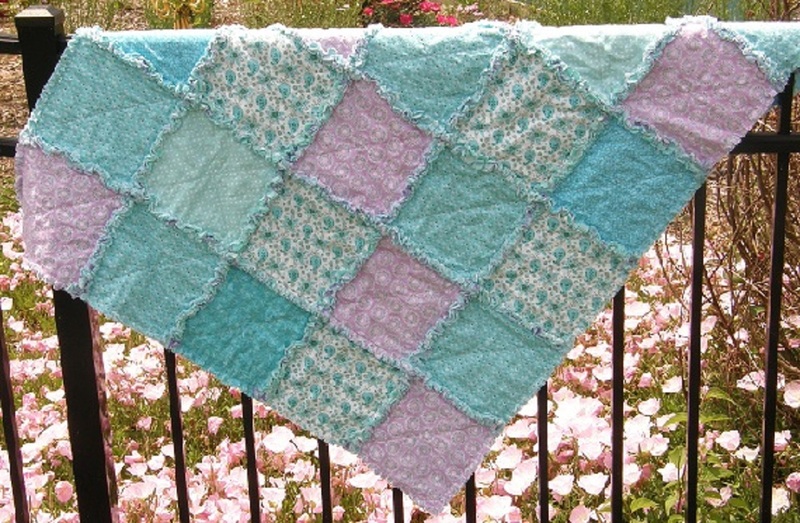 Our handmade baby rag quilts are "The Perfect Baby Blanket"! Do you want your baby blankets to be just like any other that can be picked up at the local mall? Or do you want something so unique, so carefully crafted that no one else will have one exactly like it? Of course you want The Perfect Baby Blanket! All our baby quilts are made of 100% cotton and cotton flannels in carefully selected coordinating prints. Cotton is a natural renewable plant fiber, perfect for a newborn baby. Did you know that cotton is non-allergenic? This means no itching, scratching, ugly redness on your newborn babies skin! It's even static free! Yep, you read that right! Cotton is incapable of holding an electric charge. So no sudden little electric shocks when it's cold and dry in the house to shock your little one. We know you want only soft fabrics touching all that newborn skin. Cotton is perfect. Our quilts are soft and only get softer with each and every washing. All the better to cuddle! Cotton is the perfect all weather fabric due to it's breathability. Because it's a natural fiber, it allows for better air circulation. In warmer temperatures, it naturally draws heat away from the body, helping your little one to stay cool and dry. In cooler temperatures, it provides insulation to keep baby warm and protect them from the wet and cold. Our baby quilts are the perfect blanket year round! Our quilts are made of three layers of cotton materials. The top layer is a unique design of carefully selected 100% cotton prints that creates a special rhyme theme. The back layer is a coordinating 100% cotton flannel print. In between these two layers of rhyme story telling prints is another layer of coordinated cotton fabric. This layering of cotton fabrics creates a lightweight quilt perfect for babies and toddlers. Our quilts are not heavy, which allow your baby to have a comfortable sleep. While lightweight, the layering of the cotton fabrics adds to the insulation effect keeping your little one cozy and warm. 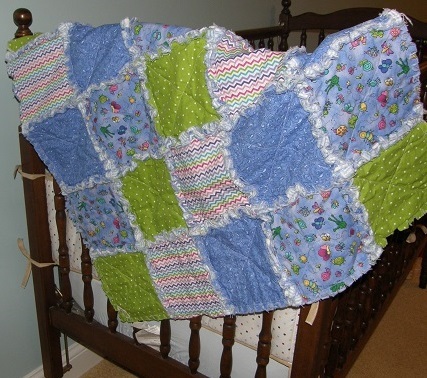 Even in warmer temperatures, the baby quilts are not too warm, as the fabric draws heat away from their little bodies. 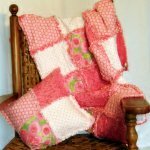 Our homemade rag quilts are so easy to take care of. They are totally machine washable and dryable. No dry cleaning bills! No special care costs! Cotton is the only fabric that is stronger when wet than dry. So our quilts can take repeated laundering and still look fabulous! 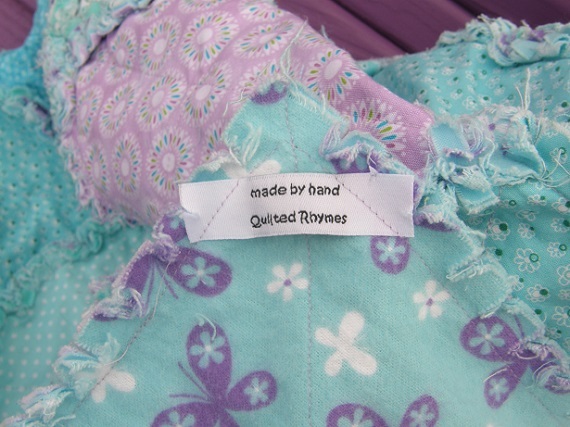 As a matter of fact, the more our rag quilts are washed, the softer and more adorable they become. This is because those curly little seams you see there between the quilt squares actually get even more curly! The attention to detail and craftmanship makes our baby rag quilts a true quality item. Each fabric selected for the themed quilt is hand cut into 8" squares. Hand cutting the squares allows us to cut the prints perfectly to create the most beautiful designs. The printed squares are then laid out carefully to tell a nursery rhyme story. All the coordinating prints must align to create the best picture once they are sewn together. The squares are assembled in layers, the front print, the middle layer and the back print. Care is taken to be sure that the print for each layered square is laid out correctly so the finished pattern is perfect. The layered squares are sewn together with the seams exposed. The exposed seams are what creates the "rag" design of the quilt. Once the squares are assembled they are sewn together to complete the nursery rhyme quilt. Beautifully coordinated cotton colored thread is used to put all the pieces together. 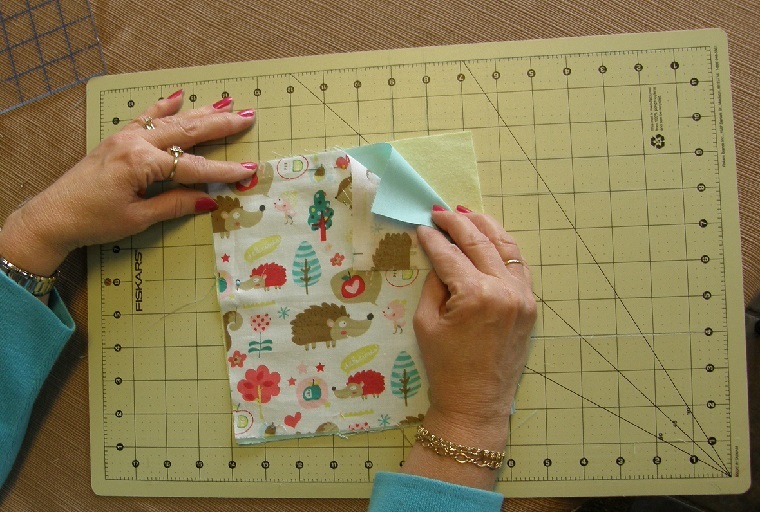 To make our quilts durable, we sew with a full 12 stitches per inch. 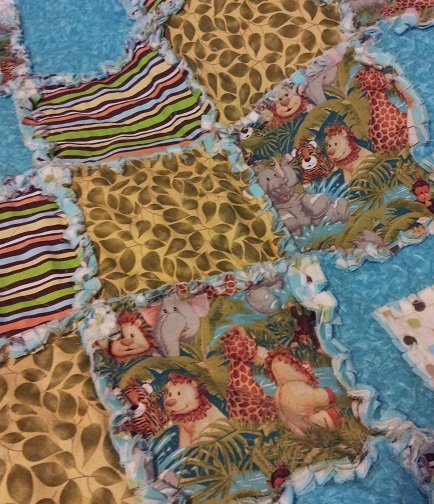 After the baby quilt is fully assembled, the exposed seams are then hand trimmed to start the "ragging" process. We hand cut so there is no concern with over cutting too close to the seams. 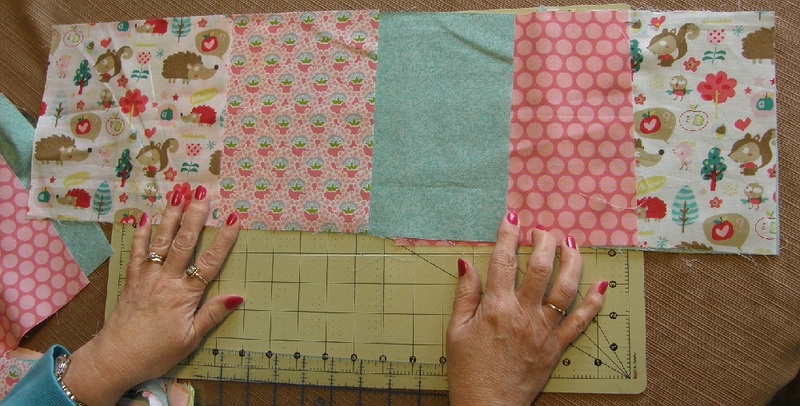 We've taken care to determine the perfect size to make our rag quilts. Each one is 34" x 41" in size, just right to snuggle that newborn into a sound sleep. They are even the perfect size for your toddler to carry around as their favorite "blankie"! Not too big or heavy for them to manage, while being soft and cozy for nap time. Our rhymes make our baby rag quilts totally unique! Each and every quilt is based on a favorite children's verse, rhyme or song. We carefully select each print to tell the story of a specific rhyme. Your quilt can be used to teach your little one the rhyme or song that their quilt is based on. Can't you just picture that little one as they gain a voice, sharing their rhyme with everyone? These quilts are also fabulous for creating the theme of your newborn's nursery. You'll find bsby quilts for little girls and little boys. And if you choose to go with a more neutral theme for your baby room, we have quilts that are not gender specific too! 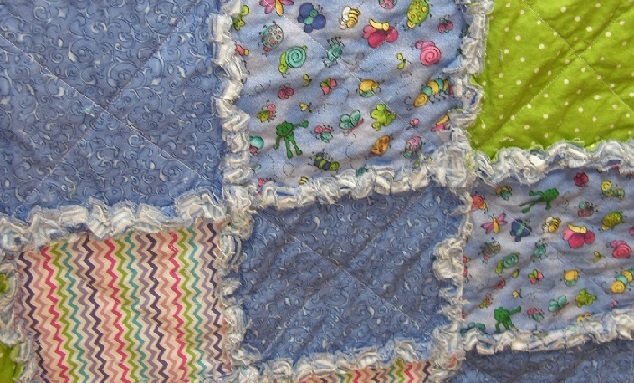 One of the best things about our rhyme themed rag quilts is that they are absolutely one of a kind! There are literally hundreds of verses and songs for us to choose from to create these fabulous quilts. So you'll always know that you have a true one of a kind heirloom quality quilt. No one will ever have one just like yours! These quilts will bring delight to any baby nursery with their whimsical prints and colors. From baby bugs, ducks to flowers and truck prints that are perfect for little ones! Our quilts are sure to become not only your favorite baby blanket, but I'm sure they'll quickly become the favorite "blankie" of many a little one.